During 2015, Improv Conspiracy member Mike Brown is going to have a chat to every single member of the Conspiracy - about life, about improv, and everything in between. This is: You're Going To Meet Some People. Today is a special Play Like A Girl edition. Mike speaks to cast members Nadine Sparks, Ellyse O’Halloran, Laura Buskes, Cat Commander, Amruta Nargundkar, and Kay Chan. Play Like A Girl has three editions left – Thursday April 2 [ed- SOLD OUT], Saturday April 4, and Tuesday April 7 [ed- SOLD OUT]. See it 6:30pm at the Croft Institute in the City. 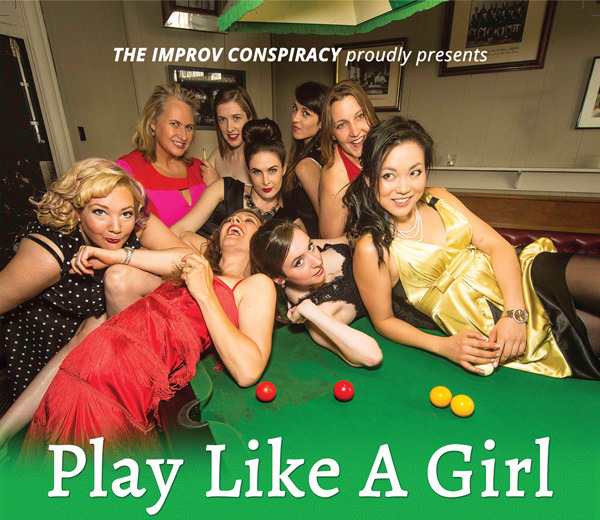 Mike Brown: Play Like A Girl is the Conspiracy’s first gender specific improv show. What has it been like performing together with a group of women compared to playing as part of your Harold team or playing as part of the Remix, where the genders are mixed? Are there differences? Laura Buskes: Definitely. There are definitely differences. Merrilee [McCoy, Melbourne based improviser and producer] really nailed it when she was talking about something like this that she’s done before. She said often in improv troupes you as a girl often rely on men to play certain characters or do certain moves in a show. So it’s quite refreshing to have onus back on to you that you are responsible for everything. Kay Chan: I don’t know, it hasn’t been too different for me. Because you can always choose to play a man or a women, and even on my Harold team [Airblade] I can endow anyone as a man or a woman. The only difference is that there’s heaps of chatter, which is a good and fun thing, whenever we rehearse people want to talk talk talk [laughs]. Nadine Sparks: The reason we wanted to do it is Nightingale, which is an all-female Harold team made up of any females [in the Conspiracy], we were working really well together, and Ellyse and I, and Sophie[Fernandes] and Lucy [Horan]who were in Eye Curtains which was another female troupe, and that was working really well, so we just thought it would be really nice. I mean I’ve been on a Harold team where I’ve been the only female for about two months, you know what I mean? So it’s just nice to, you play differently with women, and I think it’s a nice energy and it’s really nice to find out how different people play. Ellyse O’Halloran: But like this is the first time in Conspiracy where we’ve had enough women to put on an all-women show. We’ve been talking so much about marketing ‘cause were like, at the end of the day it’s not a show by women for women, it’s a show made by women, that’s just it. Cat Commander: And I think the whole point of improvisation or art in general, storytelling, is about learning how to empathise about other people and for me I love being able to get up and play a cranky old man, which as an actor is something that I’m never going to get cast at, and also as a human being, that’s the most interesting thing to get inside of, that you don’t know. There’s nothing to stop me from playing a guy in a Harold, but I have to step up and do it when there’s no guys around to do it. And that’s fun for the audience to have to suspend their disbelief. And not to plug my other show, but the other show I am directing is a drag king's show and I’m really interested in gender and identity and how performance helps us to figure out who we are and help figure out who they are. Amruta Nargundkar: For me the experience of playing with women hasn’t been different to playing with men. But what is special about this all-women troupe is the political aspect of women being able to be in a group together and do comedy, and not just be bitchy, backstabbing, catty, but being able to do good artistic work like any other human being. So from that point of view playing in this has been incredibly liberating as a woman. Whether Harold or The Remix, people come into improv teams at different times. With Play Like A Girl you've all started on this path together. You've all started learning at the same time, practicing at the same time. What's it been like to develop that as a group? Nadine Clark: I think that it's been really great and it was open to everyone, so we did it based on availability, so there were some women in Conspiracy who were fabulous players but couldn't commit to that weekly Saturday rehearsal, so it was really "we want to do this project, who can do this project?" It's been a really nice process too. So Adam Kangas [Improv Conspiracy Artistic Director] started teaching us the new formats, then Sophie and Lucy took over as the coaches, so it's been quite a fluid process in working together like that. Even in terms of them being coaches, we've all worked together in that process. Ellyse O’Halloran: And we're doing a format that has never been done before [ed- in Melbourne], so we're all learning and developing it together, and performing it together for the first time. Nadine Clark: It's two formats together, so it's kind of like a new format! Amruta Nargundkar: And that's really exciting, that's so exciting to be in a big group and learn something new together, and we forget our Harold teams and all the loyalties, and we're just loyal to this new format and each other. That's really fun. Kay Chan: And it was so satisfying to have it all come together, things are going really well; when at the start no-one knew anything about it. Cat Commander: And I felt really in the deep end being new to a Harold team and never being in The Remix, when so much of this is similar to The Remix form. So I felt really really swamped in those early rehearsals and it's pretty cool that everyone's on the same page no matter what the experience level, everyone sort of felt a bit confused to start with, and then to have it finally click in to place little by little, it's very satisfying. Tell me a little bit about this form - what is it, what do you all like about it? Ellyse O’Halloran: The main show is centred around an event, we take a word and use that word to inspire an event. This is a day at a place where the event happens. Before the event part of the show, we visit the characters' backstory, so we learn a bit about all these different characters, so there's heaps of characterisation in it and we're all playing like a bold character. Then in the second half we go to the actual event - so this is the fifteen minutes when the event actually happens. So the first half is more character driven and the second half is more concept driven. Nadine Clark: So Close Quarters and the Eventé are the two forms - I think they work really well together, and I love how character driven it is. I love how you are the whole character for the whole time. At first I wasn't making as strong choices, but it forces you to make really strong choices in characters, so I really like that. So I really like that notion that it's like a location Harold in that sense, how we're all at this one place, everything is in this one place, we don't have to jump around. Cat Commander: I'm a total plot junkie, and you can't really play in Harold, so I love that we can play plot in this. But I also love that it's non-linear, so even when it feels fragmented, you can still tell a story with a beginning, middle, and end, it's just no-one knows what the story is until you get to the end. That's really satisfying to discover that along with the audience. Amruta Nargundkar: And there's also a lot of freedom in the format. The scenework is character driven but doesn't have the constraints of mapping, or sticking to thematic themes or drawing from beats. You can have gossip scenes and you can have non-sequiturs, it's really relaxed, and I love the fact that we can do so much in the scenes - even walk off stage. Laura Buskes: It's nice to be able to make a really bold move where maybe in a Harold or in other formats doing that bold move could be quite detrimental to the rest of the format. Where with this you can do something that's quite crazy and then in the next scene, it hasn't happened yet. So you can go from these really intense climatic scenes to something that's just another gossip scene. So it's kind of ebbing and flowing, going from something that's quite tense to something that's quite gossipy. Kay Chan: It's cool that you can do anything you want, as long as it's in that fifteen minute, fifteen kilometers? Is it fifteen kilometers? Kay Chan: Oh, no wonder I thought it was so freeing all this time! So if Play Like A Girl was ever asked to endorse a product, what would it be and why? Laura Buskes: Baking. Baking goods. Ellyse O’Halloran: Who do we want to sponsor us? That's the real question. Cat Commander: Given that we have so many dietary requirements, vegan baking goods is what we're after. Some of those fake eggs or something? Cat Commander: Gluten free, yeah. Nadine Clark: We had Galentines Day, and yeah. So there's been I guess, an element of festivity around it as well, yeah. Even though it felt, it feels so good now but there were elements where it felt like... ahhhhhh. Nadine Clark: "Oh no, what are we doing!?" So when and where is it on? Nadine Clark: It's on at the Croft Institute, it's on at 6:30. Most nights, not Sundays, not Mondays, not Wednesdays. Nadine Clark: And not Good Friday which is a shame, because it's a good day for the festival. Cat Commander: -on Good Friday as a group, instead. Because we haven't actually hung out together as a group. Nadine Clark: You can come and see my show Rehab. Nadine Clark: Just in case you didn't know I'm doing a solo show called Rehab as well. Laura Buskes: We can see it on Good Friday, have some unleaven bread. Cat Commander: Gluten-free, unleaven bread. Laura Buskes: Come see the show. Cat Commander: It's a great show. Nadine Clark: Yeah it's a fun show, it's diverse, it's not like watching the same one comic do their own solo show for 50 minutes. Cat Commander: It's spontaneous and so joyful, so that's what you'll get out of it. Amruta Nargundkar: And Play like a Girl, people! Mike Brown is an Improv Conspiracy alumnus currently living, working and improvising in Chicago.